11048 N. Lakes O The Su Dr. Please closely follow the directions below to find us. No matter if you are coming from Fairbanks or Anchorage. Do not use you phone maps until your get to Willow. You will be sent on a wild chase! Drive into the Willow Town site. You will turn West on Long Lake Road. Then on your phone maps do a search for "Alaska's Heritage Lodge". It will take you right to us. At Willow turn west on Long Lake Road. It will curve several times. Stay on the pavement. Go exactly 3.5 miles, turn right on N. Lakes O The Su dr. Go exactly .5 miles. You will see our sign and driveway on the left. 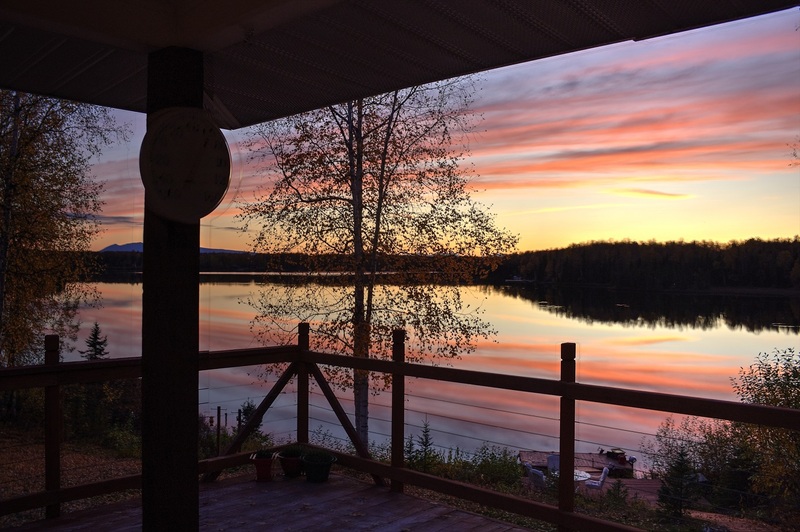 Alaska's Heritage Lodge is an adult only Remote Lake Front Lodge, Bed and Breakfast, in Willow, Alaska! Even though we are remote, we are accessible by paved road, bush plane winter or summer, and snowmobile via the Willow winter trail system. Maybe you are looking for a romantic weekend getaway for two. Or a place to have your company retreat, Christmas Party, or Team Building Event. We can sleep 24 people in beds. We offer summer and winter vacation packages. The Iditarod goes right by us on our lake. We are on your way to Talkeetna and Denali Park. For a true Alaskan experience, look no further than Alaska's Heritage Lodge!